Today we picked blueberries. 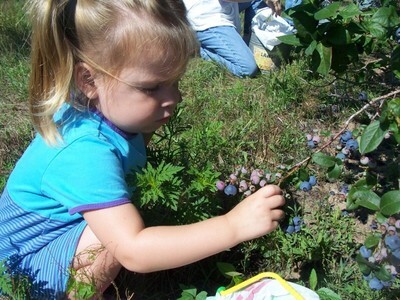 The last time I picked blueberries was with my mom and my aunt and I was a child. Blueberry picking takes on a whole new meaning when you are the mom holding one child's hand with another child strapped to your back! I worked hard for my 4 lbs of blueberries we picked today. Ever summer it is my goal to find somewhere nearby to pick something. I am clearly not that picky since I am open to picking just about anything. 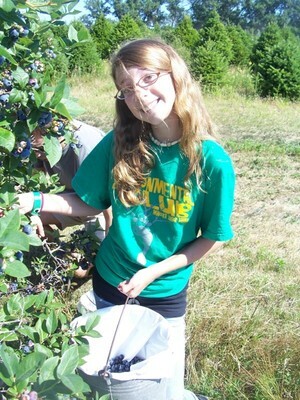 This summer was the first time I actually found that somewhere, Tammen Treeberry Farm, to pick something, blueberries. Today was the first day of the season. The farm opened at 8 am. After picking up my little junior high assistant Carly, Aislynn, Isla, Carly, and I arrived at approximately 8:30 at the Treeberry farm. We pulled in and I saw only a few cars parked. I turned to Carly and said, "Great! It doesn't look like that many people are here yet!" Then I saw a sign that said "Blueberries staight back" It was then that I saw the rows of cars, and eventually the rows of people in line waiting to become migrant workers. The people at the front of the line, needless to say, meant business. They had collapsible stools in hand, special bucket necklaces and knee pads. There were no smiles, only game faces. Of course when I asked the people at the front of the line (which I thought was the back of the line) if that was the back of the line, they were very quick to point me away from where they were standing. So we waited. I have not stood in a line that long, since riding amusement park rides when I actually had the time or desire to do that sort of thing! More than an hour later, and two baby carriers later with Isla, we were hauled away by the tractor pull to blueberry bush land. 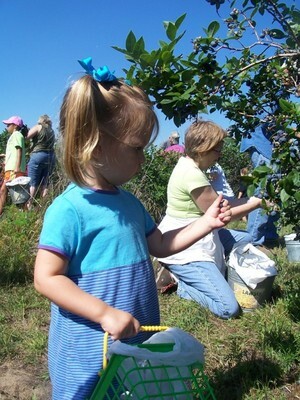 Not being professional blueberry pickers and toting two children with us, put us behind everyone. It took us a while to realize that we were basically trailing everyone and getting their "left-overs". There were more than enough blueberries to go around, but we were sort of getting second pick. We also made the mistake or lounging around eating blueberries, when 20 minutes in to our "picking" we realized we had been doing too much "eating" and really had hardly anything in our bucket! 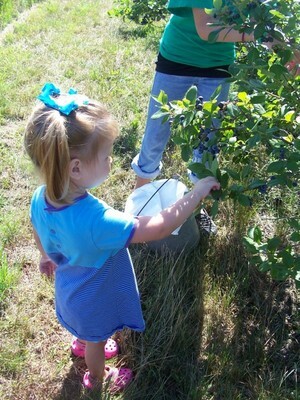 The girls did great and Aislynn enjoyed putting the blueberries in the bucket. However, she was a little too undiscriminating and was putting ones off the ground in the bucket, green ones, smashed ones. Her standards were a little too low. She wouldn't cut it as a migrant worker. After picking about half a pound and already being hot and sweaty with two little girls who were about ready to call it quits, that is when we kicked it in to overdrive finishing off the day with a strong 4lbs. Our bucket only barely half full, looked like nothing compared to everyone elses, one, two, and three buckets full (roughly 10-30 lbs). I have a keen sense for blueberry poundage now. My goal for our morning of blueberry picking was not to see if we could pick enough to feed our family for the entire year, which was a good thing since we did not come anywhere close to meeting that quota! My goals was to get my little girl to eat a piece of fruit. With Aislynn's food sensory and texture issues, she currently does not eat any, zero, fresh fruit or veggies. And I mean zero. Sometimes in feeding group or at home she'll barely try a piece or something, but it is rare. And for some reason, she really wants nothing to do with fruit, even though it is sweet and yummy, most fruit has very distinct textures and flavors, and she wants no part of it. So I started thinking, maybe if she was totally surrounded by ______ fruit she might just try it in its natural environment. So my biggest goal was to get her to eat a blueberry on her own. She has previously only been open to smashing berries or giving them small kisses. After Carly and I picked and ate more than the daily recommended antioxidant and fruit intake for the day, Aislynn distributed some berries, "One for Carly, one for mommy, one for Aislynn." We all did a count down, one two, three, and ate our berries, including Aislynn! She gagged a little, but she chewed it up and swallowed and did a small cheer for herself. I was very happy. Aislynn did not inhale as many berries as I did, but she ate at least 4. I wouldn't say they are her favorite food by any means, but its a baby step in the right direction. All it took was an early morning wake up, a drive, a long wait, a tractor ride, and hundreds of rows of blueberry bushes to get Aislynn to try some fruit. That's not so bad. And definitely worth all 4 hours. 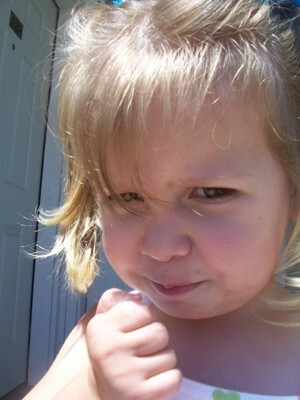 This girl means business...well maybe not, I think she picked like 3 ounces. Isla was a little confused, since when she fell asleep she was on my front in a carrier in a line of people. 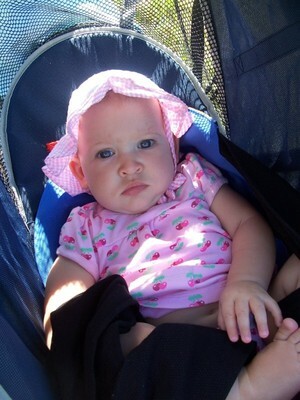 It was getting too hot, so I took her out of the carrier and tried to relocate her to the stroller (unsuccessfully). Sho woke right up and was a little confused to now be in the midst of blueberry bushes, clearly a different location! My sweet little assistant Carly. She earned her blueberries! 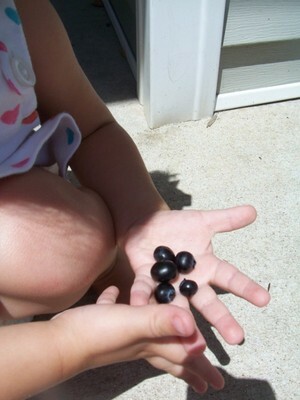 Back at home, Aislynn was happy to feed me that handful of berries. "Mommies turn!" she said...somehow Aislynn's turn never came. Thinking about trying another one. Maybe not. 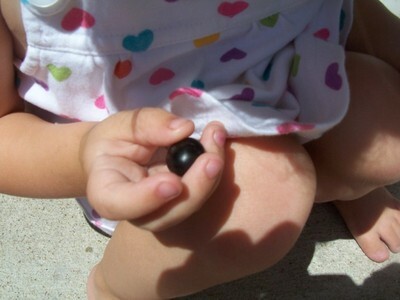 its very exciting that she tried blueberries for her first fruit experience.... especially since that would be the very last fruit on the planet most people would eat in the raw! Banana's, apples, strawberries, etc would be first before blueberries. they have a strange feeling, almost rough on the top part of them. So for her to have not only put it in her mouth, but actually eaten it and swallowed it...she has really come a long way with food. If she is where i'm thinking she is in eating food, then that is a huge step!